Four options exist for police dealing with young offenders. The choice depends on the seriousness of the offence, the degree of violence involved, the harm caused to the victim, the attitude of the young person to the offence and whether the young person admits to the offence. recorded without offender details Minor summary offences with no violence or related issues, e.g. swearing in public. A warning can be given on the spotPolice record the giving of a warning but not the young persons name. formal, recorded More serious offences, e.g. stealing or damage to property A young person can only be cautioned if he or she admits the offence after being given the opportunity to receive legal advice and agrees to be cautioned.A police officer or respected community member gives the caution to the young person. administered by DJJ Any offence that warrants a caution or is more serious, e.g. stealing, damage to property, assault, and where a victim has suffered harm.Note: Previous cautions or conferences may affect whether an offender can be warned, cautioned or sent to a youth justice conference for future occurrences. 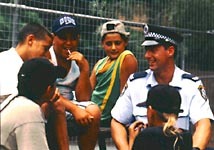 The decision to have a conference can be made by the DDP, court or NSW Police Specialist Youth Officer.A conference can only be held if the young person admits the offence after being given the opportunity to receive legal advice and agrees to attend a conference. The conference cannot impose a more severe outcome plan than a court would do. A court must deal with murder, manslaughter, sexual offences, domestic violence, drug trafficking and any offences that result in the death of a person. This includes motor vehicle offences where the young person is old enough to hold a license or permit under the Motor Traffic Act 1909. The court can impose such penalties as detention, intensive community supervision, community service orders or fines.The Director of Public Prosecutions can refer back to Police for a caution. The Children’s Court can give a formal caution.